Franky Valentyn is an Australian musician based in Blacktown amidst Sydney’s west suburbs. The fact that Franky is a self taught musician with no formal training or ability to read music hasn’t prevented him from being a successful multi instrumentalist and musical director. Proof that talent triumphs over academia. 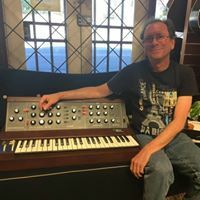 Having written and recorded music for children’s television and sporting events his styles are diverse as they come and sites being influenced by Rick Wakeman, Yes, Kate Bush, The Beatles, E.L.O. and Mike Oldfield. All this becomes evident when you listen to Franky’s ensemble of singers and musicians performing on his album All In A Dream. This is an album i found very easy to like as it employs many of the eccentricities i enjoy about traditional Prog Rock yet infused with a fun element. Franky Valentyn just like his music doesn’t take itself too seriously which is why i enjoy this album so much. The opening song Gothic Horror instills the Goth/Steam Punk idiom reflected in the albums artwork which reflects a Tim Burton type of scenario. Hats off to artists Lou Steer and Lilly Moorehouse. There is a grand sense of theatre within Gothic Horror which can be a little Andrew Lloyd Webber in places, that is until you hear Franky Valentyn play an absolute bitching Mini Moog solo that would have the latter-day Rick Wakeman Quacking in his boots. The operatic nature is interrupted nicely by some great rhythms which had me thinking of TV shows like The Adams Family and The Munsters. There’s even a Theremin in there Played by Yesfanz member Robert Forbes. It certainly brought a smile to my face. Talking of Rick Wakeman, his melodic and virtuosity can be plainly heard throughout the sweet lament to absent friends Goodbye My Faery Queen. Wakeman’s style is present in Franky’s playing and chord structures throughout the whole album. A fitting instrumental to celebrate lost friends and loved ones without the need for dour drones or musical sentiment. A crack of thunder heralds the arrival of Sara, A Bonnie Tyler style epic leaning more towards the Meatloaf velocity of song delivery. A song about pointing the finger and accusing someone of something be it rightly or wrongly. Powerful vocal by singer Nikki Bennett. there is some great story telling on the album. One song in particular i found totally enchanting is Hope For Llewella. The sweet tale of an elderly lady Llewella Hope Davies known to Franky Valentyn who at the age of 99 was holding out for her telegram from the queen. She became a local celebrity holding sway in her house determined not to be moved by developers wanting to build a high school where her home stood. Regretfully she didn’t get her telegram. Some great electric piano and memorable melodies. The multiple backing singers giving the impression of a school choir. Indeed there is a fair amount of sentiment in these finely penned songs. The title song All In A Dream finds Franky in reflective mood wondering what it would have been like had he not moved from his old family home which he often passed and thinking how much things have changed. Great vocal by singer Michael Carr some of the chord structures reminiscent of Wakeman’s King Arthur album. Thankfully Michael Carr’s voice injects a little more grit than the Ashley Holt of yore! Among Franky Valentyn’s many talents he also toured with The Beatnix a Beatles tribute band as both keyboard player and musical director during which time he was challenged to write a song about the Paul McCartney debacle and the conspiracy theories about the original Paul McCartney having been killed and the present Paul McCartney being a hoax. Challange accepted Frank penned the rather splendid Paul’s Not Dead. A song as quickly titles as it was written methinks. The middle 8 of the song contains a vocal by Lance Smith who does a good job pounding out the Macca overtones whilst the song ends with an appropriate guitar solo by Andy Payne. And though Paul’s Not Dead doesn’t quite reach the grandiose of A Day In The Life’s eponymous finale it will certainly raise a smile with many Beatles fans. To further showcase Franky Valentyn’s penchant for large scale production All In A Dream concludes with a multi layered keyboard opus The Jovian Moon Suite. Listened to in it’s entirety with the volume set at 11 The Jovian Moon Suite is a total joy to listen too. Composed as a submission requested by a Yes fanzine (Yesfanz) called South Side Of The Sky it was originally intended for a larger scale work about the solar system. Split into four movements Europa, Io, Callisto and Ganymede, there is everything from delicate piano to all out drama including some powerful keyboard orchestration. Great to hear vintage synthesisers like Mini Moog and ARP Oddyssey in the mix too. In keeping with some tradition a reprise of Gothic Horror is included reminding all where we started out on Franky Valentyn’s journey. From his love of Hammer horror movies to moving tales of courage, tenacity and loss, to the outer reaches of the solar system. Not shabby at all pop pickers. As a self confessed Prog head and lover of music that captivates, thrills, entertains what ever label you decide to tag it with All In A Dream ticks a lot of boxes for me. Tell tale signs like being unable to leave your parked car until a song has finished i consider to be a fair barometer that what you ar listening is hitting the spot. This album does just that. Apart from the captivating narratives the sheer fun aspect of this album suggests a hearty recommendation and immediate investigation. 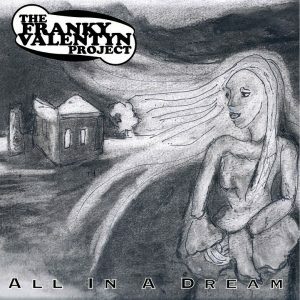 All In A Dream is available from i-Tunes, CD Baby, Amazon or direct from www.thefrankyvalentynproject.com.au Price £12:50 for CD and £6:20 for Mp3 download.